How to bunt for a hit, including bunting tips for push and drag bunts. Yankee Doug Bernier breaks it down for both right and left handed hitters. 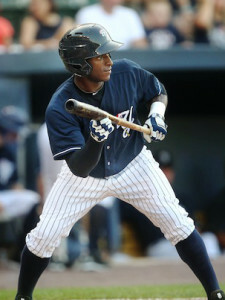 SWB Yankee Greg Golson prepares to bunt. Image by Frank Lauri. Good bunting can be an effective weapon against a tough pitcher. It can also be a strategic way to take advantage of a team with poor fielding skills, or it can be a good way for you to change things up if you are having a rough day hitting. All in all, bunting is an important strategy to have in your hitting arsenal. Bunting for a hit is a skill that is not as popular as it once was. With most kids growing up and learning to hit with aluminum bats, we learn to sit back and wait for the big hit and neglect the bunting game. Some of the most common mistakes I’ve seen when bunting for a hit are (1) trying to be too quick and (2) waiting too long until we attempt the bunt. Pro tip for how to bunt for a hit: Placement is much more important than surprise. Most of the time the infielders will be in a little tighter anyways if bunting is in a possibility. The drag bunt is used mostly when a right handed pitcher is throwing. He will usually fall off toward the 1st base side, and it’s difficult for a pitcher to change his momentum and try to make a play, especially if he is off balance. Step 1: Assume your normal stance in the batters box. Step 2: When the pitchers momentum and arm are starting to come to home plate, set your bat angle and get your base in the correct position. Set your bat angle by using the same upper body mechanics used when sacrifice bunting (hands away from body, barrel above knob, bat at top of strike zone). Point the end of your bat to the second baseman, this sets the angle to third base. Take your right foot and drop it back so your stance is now closed off toward the pitcher. This gets your feet in a strong position to start your run to first base. Step 3: Try to put the baseball near the foul line. It’s better for the ball to be bunted foul rather than bunted right back to the pitcher. If it’s foul, you still have another strike or two to try again or start swinging. Step 2: When the pitchers momentum and arm are starting to come towards home plate, set your bat angle by sliding your left hand up the bat toward the trademark (as well as your other upper body mechanics in bunting) and get your base in a position to start your run. Your left foot can step a little closer to the plate. This will open your stance up toward the pitcher and give you a better angle toward first base. Be sure not to step on the plate, stay in the batters box. If a foot is out of the box and you make contact with the ball, you are out. Note: This left handed bunting style of taking your left foot and moving it closer to home plate to get an angle, is easier than a crossover step and bunting. This crossover step involves taking your left foot and crossing your right foot, bunting, then running. This leaves you vulnerable with a pitch that is coming at you. It also involves a lot of foot and head movement which can make it difficult to lay a quality bunt down. The push bunt is often utilized with a left handed pitcher on the mound. This is because when the left handed pitcher throws a pitch, he will naturally fall off the mound in the direction of the 3rd base line. This opens up a bunting lane toward the 2nd baseman. The idea is to push the baseball hard enough to get it past the pitcher and directed toward the 2nd baseman. Most of the times if you can make the 1st baseman vacate his bag, it will be an easy hit for you. In the video: Author of this post Doug Bernier executes a push bunt to tie the game. This is a good example of why bunting for a hit can be a valuable skill and strategic move. Step 1: The set-up and mechanics are the exact same with the drag bunt, the only exception is that instead of catching the ball with the bat and gently bunting the ball to 3rd base, you will firmly bunt it towards the 2nd baseman. Step 2: Push the bunt with your legs, and use your momentum to go through the baseball. Try to keep your arms as still as possible and rely on your legs. Step 3: Try to make the ball end up where the infield dirt and infield grass meet in between where the first baseman and second baseman play. The push bunt is hard to defend if it’s done well. Step 1: The set-up and mechanics are the same as a left handed drag bunt with your upper body (hands away from your body, barrel above the knob, bat at the top of the strike zone). Step 2: Set your bat angle by pointing the end of the bat in between the 3rd baseman and shortstop. This will give you an angle toward the alley you want to lay the bunt in. Take your left foot and use a small step toward home plate and use that foot to drive toward the direction of second base. Or, you can use the crossover step and take your left foot and move it past your right foot in the direction of the pitcher. Step 4: I personally think the first way with less body movement is easier, but this is a personal preference. It can be a little difficult to get the velocity on the bunt you need sometimes this way, but its more consistent. Step 5: Same as the right handed bunt, keep the ball away from the pitcher and try to make the ball end up where the infield dirt and infield grass meet in between where the first baseman and second baseman play.